An extremely cost effective iPhone/iPad platform for fund managers to promote their products and their performance through participation in the mobile revolution. Logic for retrieving and displaying product information from your site, including product detail and pricing performance information, calculating performance and for interactive product charting. A rich news and media service where users can update the application with information from your website or view streamed video on demand. Contact and location information for your offices. A page for displaying information about your company. Your artwork, colours and branding. The initial data to populate the application. We then tailor and build a custom version of the application for you, provide samples for testing on your devices and submit the application to the App Store for you. It couldn't be easier! 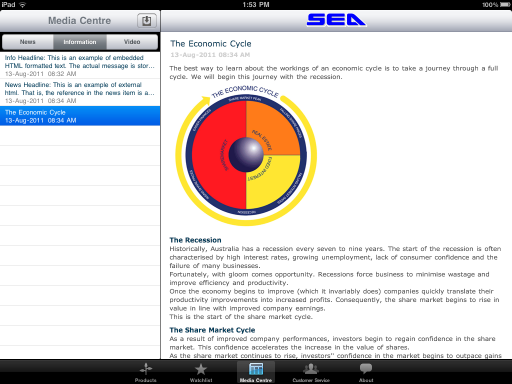 The sample SEA application has already been approved by Apple for release to the App Store. This pre-approval allows us to fast track the deployment of your application. Based on a typical submission, we can have you submitted to the App Store in less than a week (depending on the availability of your data and your testers.). A mobile kiosk for a manger's entire product range, establishing a presence on Apple's iOS platform (iPhone, iPad, iTouch) and promoting your range of products and services to your potential and existing customers. Up to date price and performance information (Based on unit price availability.). Provide performance on an almost daily basis. News and information updates, delivered as text, html or video, direct to your customer's device, anywhere, anytime. 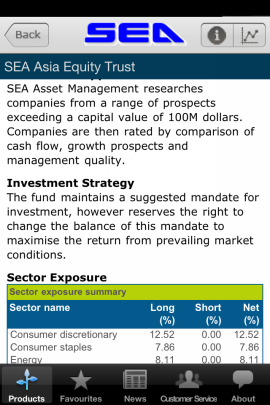 Keep your customers advised of market updates, fund updates or even information regarding the process of investing. Enhance and maintain your customer connection. 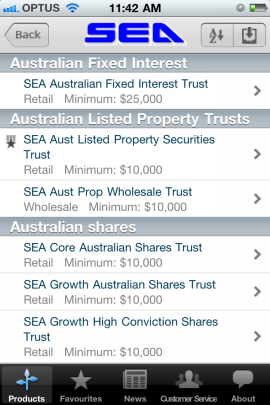 Simplicity in the selection from what can be an overwhelming range of investment options. Encourage customers to focus on their investment preferences. Detailed product information available at a glance. Make it easy for your customers to find information relating to a product. Performance comparisons across products and across benchmarks. Enable your customers to make informed investment decisions. Favourites shortlists. 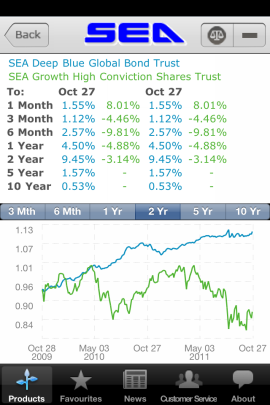 Engage your customers to select and follow the performance of a fund, arguably moving them closer to investment. A list of your office locations sorted by proximity, complete with single touch phone numbers and Google Maps location discovery. Let your customers keep in touch! A customisable information page detailing information about you, your investment approach and how you can service your customer's needs. An extremely cost effective package that may be customised according to your requirement. 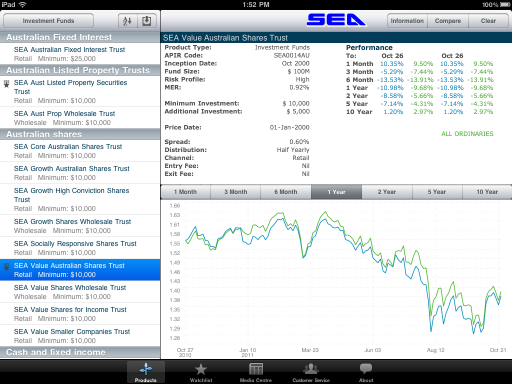 SEA Investor is designed to minimise your development, implementation and management costs. The possibility for further customisation as we can tailor the application to suit your requirement. These screen shots don't come close to the appearance of the real thing. Contact us now for a free, no obligation demonstration. Documentation and instruction on how the application works and how to provide content to the application. A set of spread sheet templates so that the basic data can be entered correctly and easily. This includes all product information and all news/information that is to be embedded in the device. Validation of client supplied data. Incorporation of client data from the spreadsheets to the internal database. Development of client specific data sourcing routines for the download of unit price data. Sourcing of unit price data, creating a final deployment database and incorporating the database into the application build. Customisations for look and feel (colours and some fonts) within the limits of the basic package. Provisioning of the final application onto 6 or less client devices for the purpose of user testing and validation. Validation of all Apple scrutinised content, including image size and resolution to minimise the possibility of App Store rejection. Final build and package for the application. Successful deployment to the Apple App Store.